I removed all of the Mario material and credited a new closing credits sequence, so you can watch just the Zelda episodes. I also rearranged some episodes for "continuity" (and I use that term loosely) reasons. 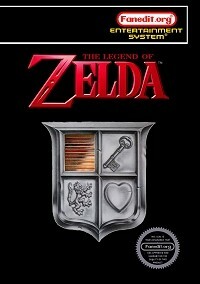 "The Legend of Zelda" was released on DVD in a three-disc edition by The Shout Factory! ; many fans felt this was excessive for a thirteen-episode series. Even the option to play the episodes without the Mario segments still retained the opening theme song of "The Super Mario Bros. Super Show". I decided to cut these out entirely as well as replace the "Do the Mario" closing credits with new Zelda-specific credits. The result fits on two DVDs as opposed to the original three. While I was at it, I rearranged the order of some episodes to have the overall "story" make more sense. Charlamagne Std for the closing credits. The "Great Bay" (Zelda) theme music from "Super Smash Bros. Melee" on Nintendo Gamecube for the closing theme. - I moved "The White Knight" (which includes a scene with a roaring fire) to before "Cold Spells" (which occurs on the first day of spring). - I moved "The Moblins are Revolting" and "The Missing Link" (in that order) between "Doppelganger" and "Underworld Connections", so Link's horrific screw-up (which originally was the end of the series) is now immediately followed by the revelation that Zelda loves Link (which now comes much earlier in the series). - I moved "That Sinking Feeling" to the next-to-last position, since it features a scene where Zelda is horny for Link and throws herself at him (originally, it came way before the love revelation). - The new final episode, "Fairies in the Spring", features a water park and could thus be considered the end of spring and the beginning of summer.